Version 0.7 is now on the Live branch for everyone to play! Check out the highlights below or download the update to try them out yourself. 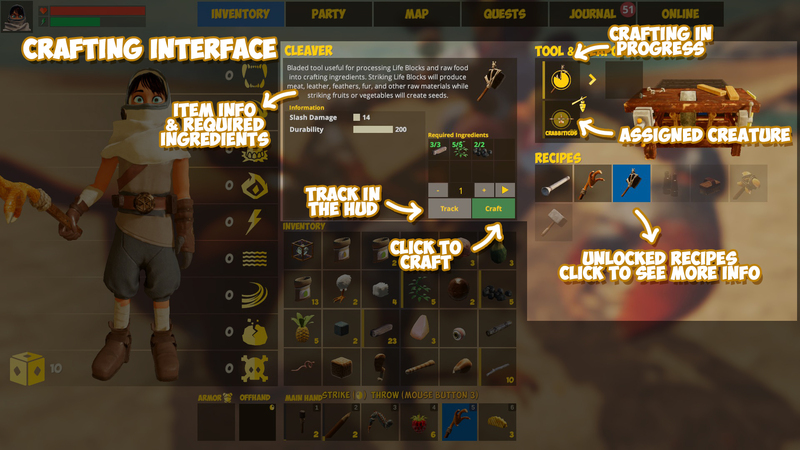 And if you’re a CHKN veteran, make sure to read *Important Notes for Returning Players* down below! 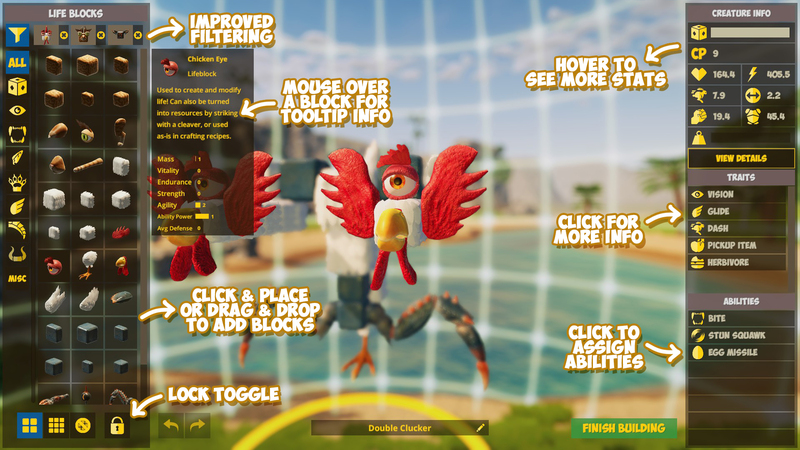 This update gets us another step closer to v1.0 of CHKN and we need your feedback! We know there are still some things to iron out in this build and we’d love to know what you’d like to see in the future. All your feedback really helps us prioritize development and improve the game. Please help us test and post your feedback on the discussion forums or in our Discord. You asked for better building so we’ve revamped the Creature Builder! The improvements make it easier to use and design the creature you want to build. We hope you agree. Try it out and let us know. You can drag & drop or click to place blocks, sort blocks by animal type, move whole chains of blocks, undo/redo block placement, and see all the stat and ability information at a glance. Every block matters! All Life Blocks add to your creatures’ stats. 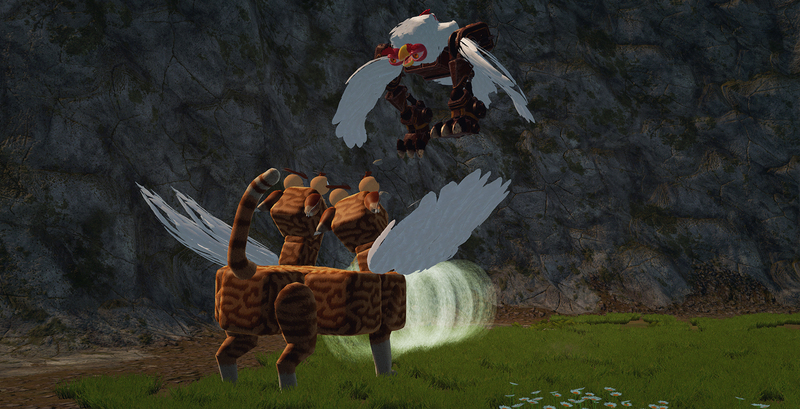 What’s important is how you combine and place Life Blocks when designing creatures in order to grant abilities and traits to your companions. Traits, on the other hand, are attributes and personality inherent to creatures. Some are passive like vision, diet type, and aggressiveness, but there are also more advanced traits with helpful benefits. A creature with the right traits could provide dung fertilizer for farming. Or add the Glide trait so your creature can cross larger gaps in the world. Wings are pretty darn useful. 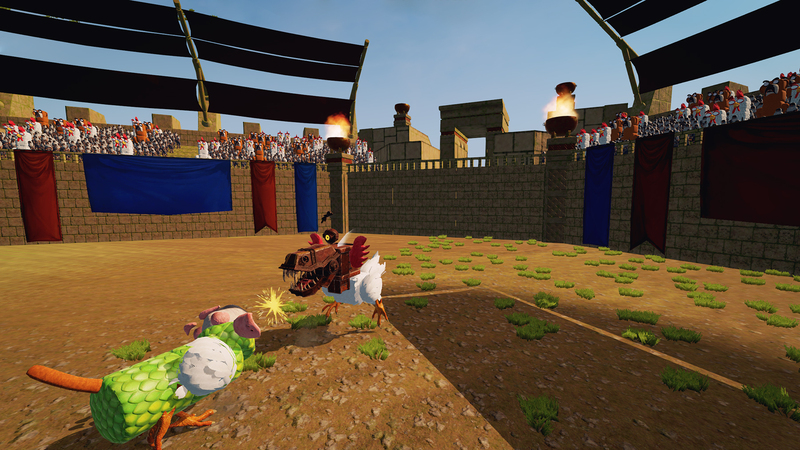 The arena is a brand new mode where you can experiment and test your creature designs in battle. Try 1v1 in an Exhibition Match, pit groups against each other in Team Elimination, or fight your way to victory through increasingly difficult challengers in the Tournament mode. The arena crowd will cheer you on… or boo you if they feel like it. They’re very fickle. 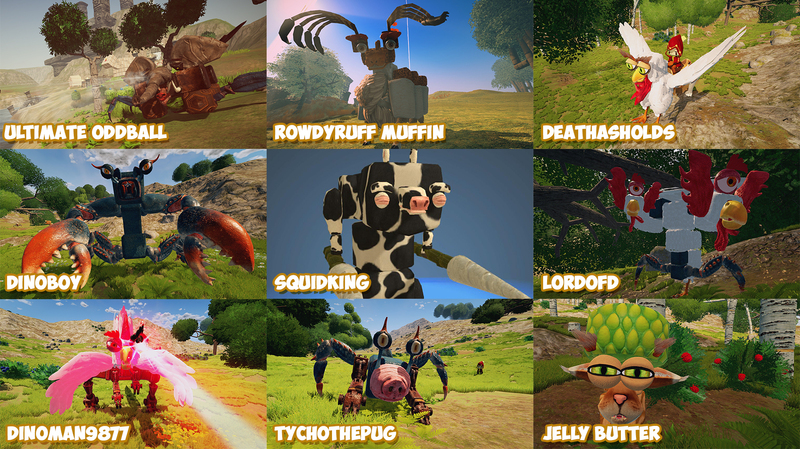 Discover the new improved world of CHKN where you must survive on an island populated by mysterious creatures. With this update, we’ve added progression for players. 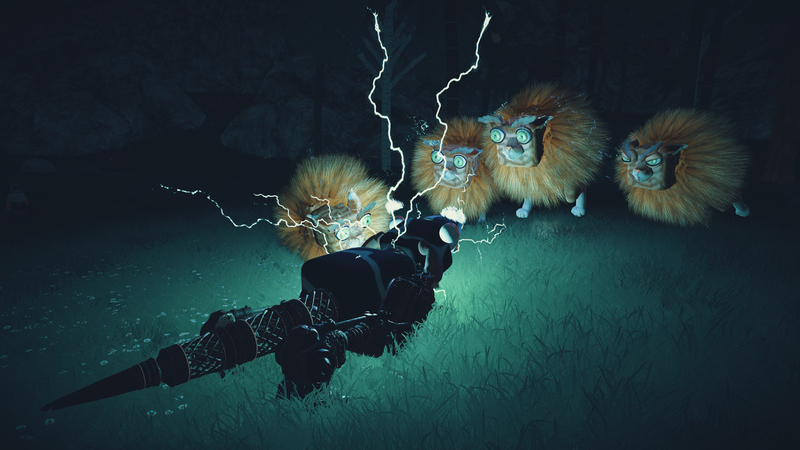 Power up your Lifeshaper and experiment with blocks to make better creatures and take on tougher challenges. A new intro experience with a few starter quests teaches the ins and outs of surviving the wilds. 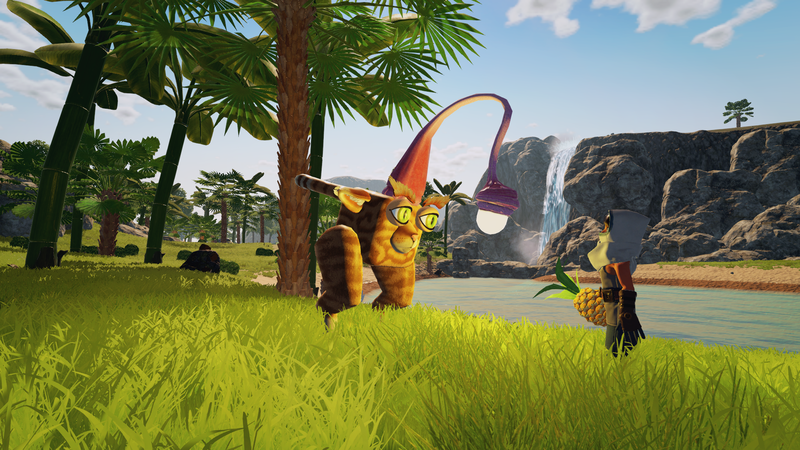 Progression has been updated, new wild creatures spawn throughout the world, improved the UI (including new discovery notifications), and lots more to make survival more challenging and rewarding. Jump in and see if you can become a master survivalist! Crafting at a creature-powered workbench. 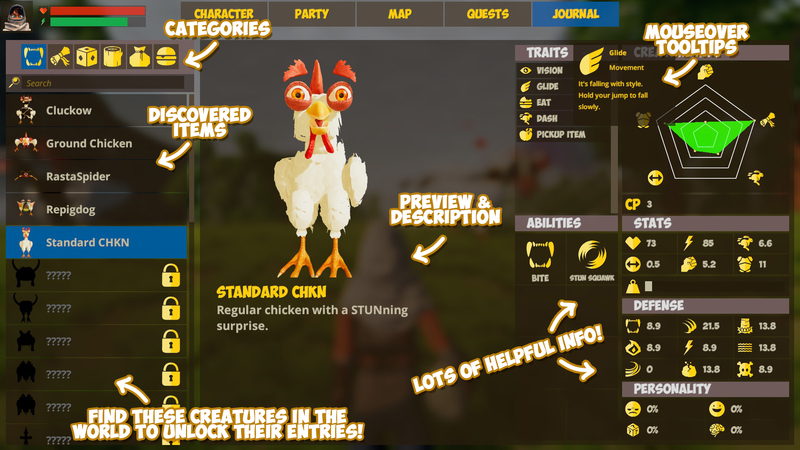 You’ll need the new updated Journal to survive and master the wilds of CHKN. Use the journal to make your own goals, whether it’s to build a homestead, fight the poachers, hunt for the elusive RepigDog, or just collect and discover all the creatures. The journal has all the information you’ll need: Life Block stats and abilities, item recipes, where to find items and resources, and a list of creatures to discover. The all new island has 2 km2 of wilderness to explore, complete with new art for the Tropical Biome. Trees, bushes, rocks, resources, and temples have all been revamped and are looking quite spiffy if we do say so ourselves. Feel more like an adventurer with the updated player avatar. 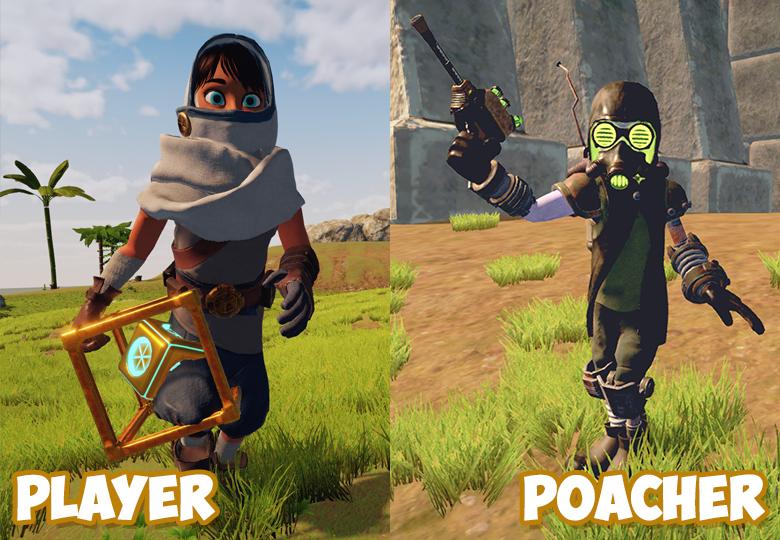 And check out the new look for our favorite arch nemesis, the Poachers. Did we mention armors yet? Yeah, there are new armors you can craft based on creature parts. Each provides a different armor rating and usefulness, plus they make you look rad. 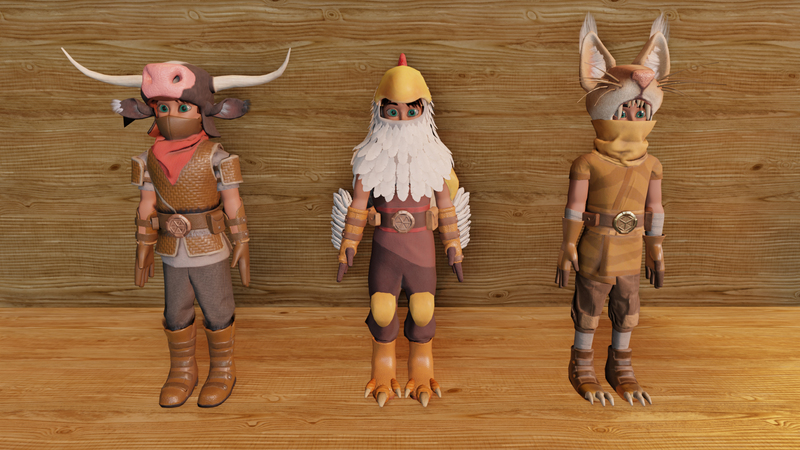 Cow, Chicken, and Cat armors. (Plus Crab, too!) We want these as action figures on our office shelves. We’ve optimized almost all the systems and increased FPS on recommended spec machines as well as reduced duration and intensity of world-streaming stutter. If auto-detect doesn’t pop up to determine your optimal settings (it only runs after a fresh install), you can adjust them manually in the Options menu. Check out this post with suggestions for which options to change to help find the best performance for you. However, note that there are still some hitches in framerate because world-streaming is not yet fully optimized. We will remove all world-streaming stutter for recommended spec computers in our next update. Your saved Workshop creatures will not be able to be imported. You won’t see those creatures or be able to spawn them in game. We’re starting with a clean slate in the Workshop with this update. But, all old saved creatures are still there in the Workshop if you want to play in the Legacy branch (see below). The old version of the game (v0.4.5) is now on a separate branch for you to play. You can swap to this branch by right-clicking on CHKN in your Steam Library, selecting “Properties”, clicking on the “Betas” tab, and then selecting “Legacy” in the dropdown menu. Swap back to “none” at any time to return to the latest live build. 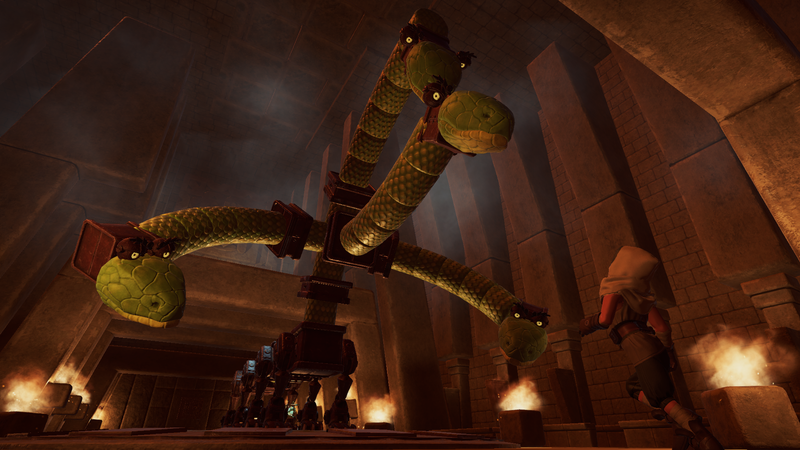 You’ll be able to see all the old Workshop creatures in this build. Your old saves are still there! You can bring them to this Legacy build by copying them over manually. NOTE: Since the legacy build is now an old version of the game, it’s no longer supported. If you have a lower-end computer, you might not see any grass. We’ve turned this off for now to improve performance and are looking at replacements. To turn off grass manually, go to Options -> Performance and turn off Grass Rendering. Sometimes a creature will get stuck on something in the world and stop following you. We’re working on Pathfinding updates to fix this but you can use the Party menu to quickly store and spawn it as a quick fix in the meantime. Patch Notes… Too Many to List! There have been a lot more changes to the game during Pre-Release development so the patch notes are too long to list here. If you want to check out all the patch notes from the Pre-Release updates, visit the News page and scroll back through the entries. Come, Dochickat! We have trees to chop and death to thwart! There’s more to come! Here’s our roadmap for the rest of the year. We really want to know what you’d like to see next. We love your feedback and read all your comments and ideas to keep us motivated in the wee hours. (What is sleep?!) We’re working as fast as we can to make CHKN everything we know it can be and we couldn’t do it without you. We’re really excited about this release and we’ve been having so much fun in our Multiplayer Adventure tests so let’s turn on the stream! 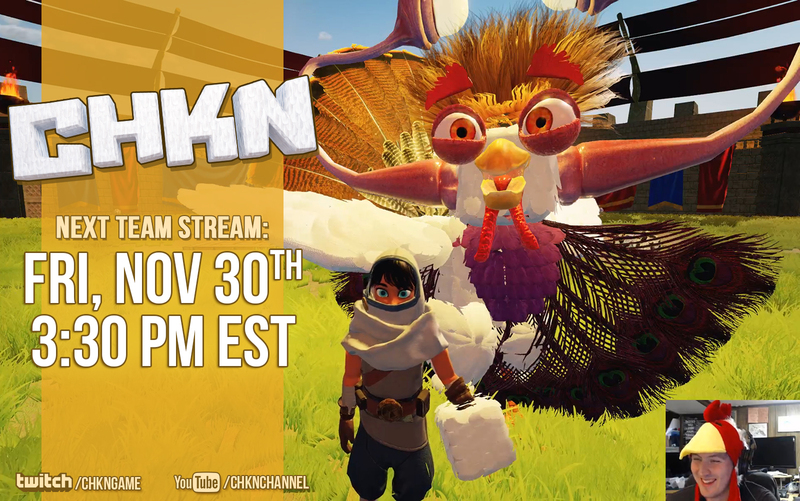 Tune in later this afternoon, Nov 30th @ 3:30 PM EST. 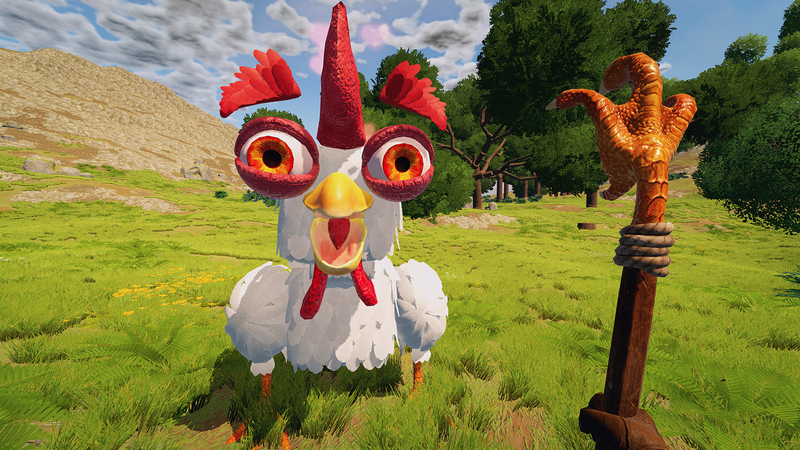 Come hang out with us on YouTube or Twitch and tell us which creatures to build, help us survive, and ask us any of your burning CHKN questions! First off, big thanks to all our previous creature contest entrants. The creativity of the MANY amazing Workshop creators really inspired us as we revamped creatures and repopulated the world. And we haven’t forgotten you, winners! Since not all the revamped blocks are in yet, it’ll be a bit before we can add your amazing creatures to the world but don’t worry. We’ll add them in as soon as we can. And special thanks to all our Pre-Release testers, Workshop creators, and everyone who supports us. Your feedback and comments mean a lot and really help us make CHKN better. Thank you! Back to work for us. Bye~~!